At Copper Country Family Dentistry, we provide a wide array of preventive and therapeutic dental services, including general dentistry for adults, seniors, and children. We believe that gentle comprehensive and preventive dental care can help you, no matter what your goal. We can help you with the health and function of your teeth and supporting tissues, your smile, or the relation of your oral health to your overall systemic health and quality of life. Even if you are anxious about dental care, from any dentist, we have services to help you with that too. Your initial exam includes visual examination, charting, diagnosis, oral cancer screening and treatment recommendations. We will listen to your needs, and provide you with treatment options indicated for you. We will also take x-rays, which includes the panoramic x-ray for proper diagnosis of the front and back teeth, as well as the bite-wing series of x-rays for proper diagnosis of decay in back teeth. If interested in information about esthetic therapies and how they may apply to you, just let us know your interest. Diagnose and treat toothaches. The CBCT can show tooth infections not visible on 2D images. Furthermore, it shows the shape of the canals within the tooth, which is very helpful for visualizing the process for the root canal therapy. Implant placement — The CBCT aids in visualizing the contour of the bone and adjacent structures, such as the sinus, adjacent teeth, nerves, and blood vessels. This aids in having an implant placement that is driven by restorative objectives. The CBCT helps to diagnose vertical root fractures and provide the appropriate treatment. For example, if a root has a vertical fracture, a root canal treatment is unlikely to work. The CBCT helps to plan surgical and orthodontic treatment that involves a situation with a tooth stuck below the surface (an impacted tooth). 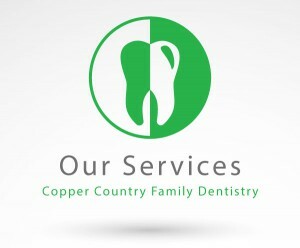 Copper Country Family Dentistry was the first dental office in the UP to provide this service! The cone beam technology refers to how the beam is shaped, and this relates to how it significantly differs from traditional medical CT images. The image takes less time to acquire, and the power and radiation is much lower than a medical CT, because it takes much less energy to obtain appropriate diagnostic contrast between teeth and bone structure. Digital scanning has been transformative for our patients and how we practice. The optical scanner obtains a precise digital model, a model which may be used for crafting a crown, partial denture, or a bite splint/occlusal guard. The optical scan eliminates the need to place viscous impression material in a patient’s mouth, and wait for the material to set. Yes, no more goop in the mouth! The products crafted from a digital model are more reliably accurate than products made from an impression material. Dr. Chalgren has used the Trios scanner from 3Shape since 2015. 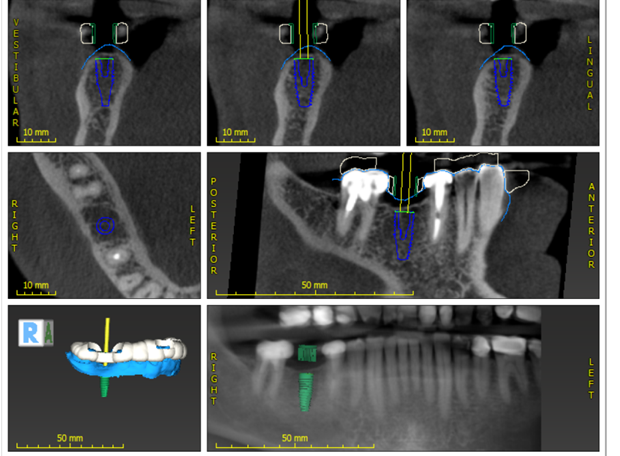 The intraoral scan is even overlayed over a CBCT image when virtually designing implant placement and fabricating surgical guide based on that virtual treatment plan. Also, no dental filling lasts forever. Some studies show that composite fillings can be less durable and need to be replaced more often than amalgam fillings. It generally takes longer to place a composite filling than it does for a metal filling. That’s because composite fillings require the tooth be kept clean and dry while the cavity is being filled. So composites usually cost a little more than silver amalgam fillings and occasionally are not covered by some insurance benefit plans. But tooth-colored fillings are now used more often than amalgam or gold fillings. Many people prefer the composite fillings over amalgam because they are aesthetic and can lead to less discoloration and cracking of the teeth. Crowns are synthetic caps, usually made of a material like porcelain, permanently placed on the top of a tooth. A crown can help strengthen a tooth with a large filling when there isn’t enough tooth remaining to hold a filling properly. Crowns can also be used to attach bridges, protect a weak tooth from breaking or restore one that is already broken. A crown is a good way to cover teeth that are discolored or badly shaped, so they also serve a cosmetic use. It’s also used to cover a dental implant. A tooth must usually be reduced in size to accommodate a crown. A cast is made of the existing tooth and an impression is made. The impression is sent to a special lab, which manufactures a custom-designed crown. In most cases, a temporary crown is applied until the permanent crown is ready. Permanent crowns are cemented in place. Crowns are sometimes confused with veneers, but they are quite different. Veneers are typically applied to relatively smaller areas. With proper care, a good quality crown can last many years. It is very important to floss in the area of the crown to avoid excess plaque or collection of debris around the restoration. Certain behaviors such as jaw clenching or bruxism (teeth grinding) can significantly shorten the life of a crown. Moreover, eating brittle foods, ice or hard candy can compromise the adhesion of the crown, or even damage a tooth or crown. Clear aligner therapy straightens teeth invisibly, without metal braces. Clear aligners show off your smile, so most people won’t even notice you’re wearing them. It’s easy to remove aligners and eat whatever you like. There are no wires to trap food and get in the way when you floss. We partner with the leading American provider of clear aligners, Clear Correct, made in Texas. If you are a good candidate for clear aligners, we will take photos and x-rays and make an impression of your teeth. A digital progression of the treatment plan will be developed, and a series of aligners will be customized to the teeth you want to move. We will check your progress and give you a new set of aligners every 4 to 6 weeks. You’ll wear the aligners for 22 hours per day, progressing through each step until your treatment is done. 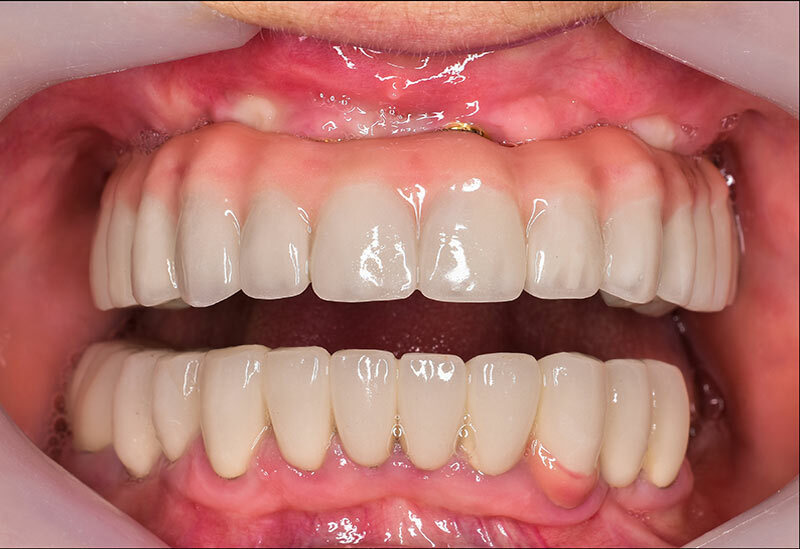 At the end of treatment, a retainer will be created. Dental implants are a replacement for a missing tooth. They are synthetic devices that are placed in the area where the tooth’s root used to be. Implants are anchored to the jawbone and act as a foundation for an artificial tooth (dental implant crown) or a permanent bridge. Implants are also sometimes used to attach dentures. Someone is self-conscious because of a missing tooth, and it affects their smile and personal happiness. The implant can improve chewing function, and reduce wear and overloading of the remaining teeth. Someone wears dentures that are uncomfortable or ill-fitting. The implant avoids the drawbacks that a traditional fixed bridge may have, depending on the individual circumstances. Dr. Chalgren has been placing implants since 2016, becoming educated and trained in implants at the Engel Institute and at the University of Minnesota. Dental implants are a popular and effective way to replace missing teeth and are designed to blend in with the other teeth. They are an excellent long-term option for restoring the smile. The development and use of implants is one of the biggest advances in dentistry in the past 40 years. Dental implants are made of titanium and other materials that are biocompatible. 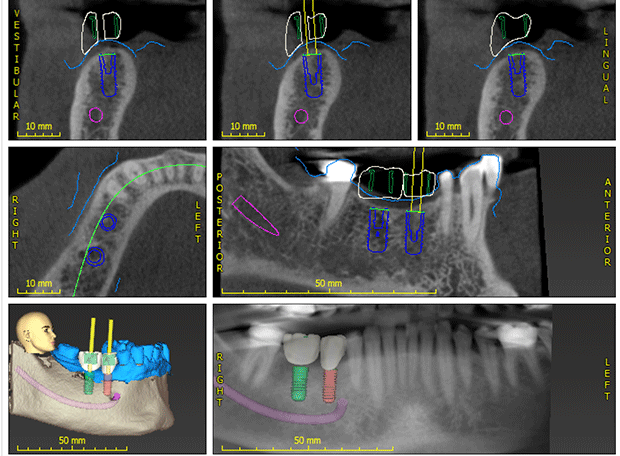 Prior to placing the implant, a cone beam CT xray (CBCT) can be used to image the bone, teeth, and adjacent structures in 3 dimensions; so that a plan is made for the selection, angulation, and placement of the implant prior to starting the surgery. With guided surgery, a custom guide is 3D-printed. That guide snaps onto the adjacent teeth, and guides the handpiece to the desired angulation and depth when placing the implant. Dr. Chalgren and his staff will go over the various treatments suitable for your condition and needs. Implant supported dentures are much like regular dentures, held in place by implants to stabilize the dentures. 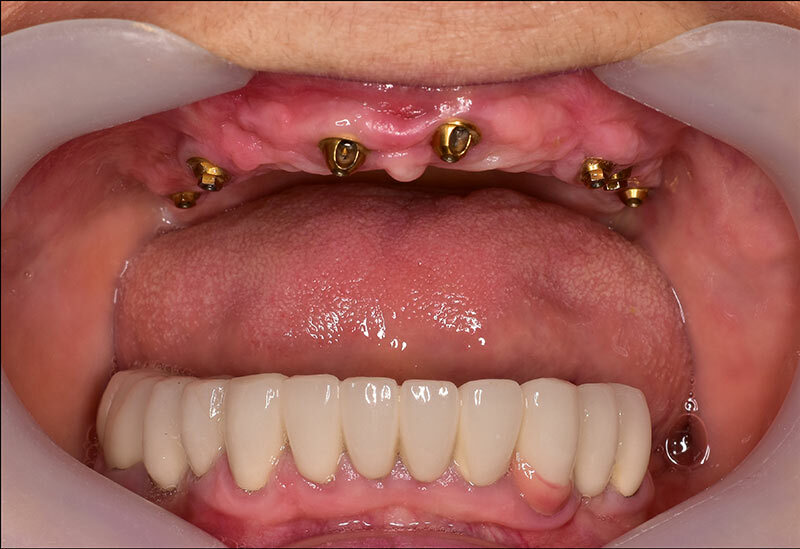 All on 4 (or 5 or 6) variation, a denture anchored by four to six specially placed implants. The posterior implants go in at an angle to integrate with the available bone, avoid the sinus, and support chewing forces. Maxillary and mandibular overdentures, which typically have two implants to retain and stabilize the denture, which is removed by the patient as part of daily hygiene. This is at a lower cost, and is usually simpler to do. This works really well for many denture patients. Most patients find that a dental implant is secure, stable and a good replacement for their own tooth. There are generally two phases to getting an implant: First, the body of the implant is surgically placed. The top of the implant at this point is nearly flush with the gumline. A temporary crown or device is used in cases of anterior implants, so that a patient does not have the look of a missing tooth while the implant is integrating with the bone. The bone around the implant remodels in a process called osseointegration. What makes an implant so strong is that the bone actually grows tight around the implant. Osseointegration means “combines with the bone,” and that takes time. Usually patients need to wait until the implant is completely integrated, three to four months, before replacement teeth can be attached to the implant and used for chewing food. After implant integration, it is time to place the artificial tooth, which we conveniently do at our office, or we can refer a patient back to their usual dentist for this step. For a single tooth implant, we will customize a new tooth, called and implant abutment and crown. The crown will be based on size, shape, color and fit, and will be designed to blend in with the other teeth. If replacing more than a single tooth, custom-made bridges or dentures will be made to fit the mouth and implants. The process of restoring with a dental implant takes some time to complete. In the meantime, a temporary crown, bridge or denture can help the patient smile, eat, and speak normally until the permanent replacement is ready. For someone interested in dental implants, it needs to be discussed, and treatment recommendations personalized. Chronic illnesses may interfere with healing, and need to be considered prior to treatment selection. Same-day implants – it is true that a dental implant can be placed immediately following extraction of a tooth. This is sometimes a good idea, but immediate placement is not advised in all situations however. And it is a great company that stands behind their product and supports their doctors. There are several other good companies that manufacture implants, and Dr. Chalgren believes some other companies have an excellent line of implants too. Dr. Chalgren has restored implants from Nobel Biocare, Dentsply Astra, Zimmer-Biomet, and others. Dr. Chalgren encourages every patient to ask about the brand of the implant and to ask how implant therapy suits their individual circumstances. Veneers are thin shells of ceramic or plastic composite bonded over the front of your teeth in order to change their shape or color. Veneers are used on teeth with uneven surfaces, or are discolored, chipped, oddly-shaped or unevenly spaced. Veneers are usually made by a dental lab technician out of tooth-colored materials to achieve a natural, life-like appearance. To obtain the best esthetics and longest lasting results, we may select feldspathic porcelain or another high-strength esthetic ceramic. Veneers are usually irreversible because it is necessary to remove some enamel from the front of your teeth to accommodate the shell. Porcelain veneers can mask undesirable defects, such as teeth stained by an injury, by tetracycline, or as a result of a root-canal procedure, and are ideal for masking discolored fillings in front teeth. Patients with gaps between their front teeth or teeth that are chipped or worn may consider porcelain veneers. During the tooth preparation visit, the teeth are lightly buffed to allow for the small added thickness of the veneer. Usually, about a half a millimeter of the tooth is removed, which may require a local anesthetic. During the same visit, a mold is taken of the teeth, and sent to the laboratory for the fabrication of the veneers. During the final “bonding” visit, the veneers are placed on the tooth surface to check their fit and get a sense of the shade or color. To apply the veneer, the tooth is cleansed with specific chemicals to achieve a bond. Once a special cement is sandwiched between the veneer and tooth, a blue visible light beam causes a catalyst to be released, hardening the cement. During a two-week period of adjustment that follows, you may notice the change of size and shape in your teeth. It is important to brush and floss daily. Porcelain veneers are reasonable facsimiles of natural teeth, not perfect replacements. It`s not uncommon to see slight variations in the color of porcelain veneers upon close inspection, as this occurs even in natural teeth. For certain patients no preparation of the teeth may be necessary. Everybody loves a bright white smile, and there are a variety of products and procedures available to help you improve the look of yours. Teeth whitening procedures have effectively restored the smile of people with stained, dull, or discolored teeth. Also, food particles are naturally attracted to a tooth’s enamel and the biofilm covering the teeth. Products like coffee and tea, berries and soy sauce are well-known for staining teeth. Over time, teeth actually become more absorbent and vulnerable to staining from food and other substances. One type of stain-caused by traumatic injuries, aging, medications, or fluorosis-actually begins inside the tooth; for these types of stains brushing and flossing don’t help. Another type of stain-one that can be helped by brushing, flossing and rinsing-is caused by external factors such as foods. More and more people today are choosing teeth whitening procedures to reverse the effects of aging and abuse from food and tobacco stains. Some commercially available “whitening toothpastes” can be somewhat effective at removing stains and making teeth a few shades brighter. However, many of these products have abrasive substances that can actually wear away your tooth’s enamel. “Whitening” toothpastes in the ADA Seal of Acceptance program have special chemical or polishing agents that provide additional stain removal effectiveness. Unlike bleaches, these ADA Accepted products do not change the color of teeth because they can only remove stains on the surface. “Whitening” toothpastes in the ADA Seal of Acceptance program have special chemical or polishing agents that provide additional stain removal effectiveness. Unlike bleaches, these ADA Accepted products do not change the color of teeth because they can only remove stains on the surface. Professional whitening performed by our office is considered to be the most effective and safest method; done properly, tooth whitening can last as long as five years, but some people want to ‘touch up’ more frequently. Over-the-counter whitening systems are somewhat effective as long as they are monitored and directions followed closely and if they can be closely adapted to all surfaces of the teeth. Common esthetic dental procedures can be performed to achieve harmony of the teeth and gums that together create the ‘smile’. Sometimes this is to correct misshaped, discolored, chipped or missing teeth. Cosmetic procedures may also can be used to change the overall shape of teeth—from teeth that are too long or short, have gaps, or simply need to be reshaped. Gingival recontouring – A procedure that corrects the position of the gingiva to remove an excess or restore a deficiency. Primary teeth, sometimes called “baby teeth” are important for children to chew, speak, and provide the guidance for the development of the adult teeth. They hold space in the jaws for permanent teeth that are growing under the gums. Primary teeth begin to appear between age 6 months and 1 year. You should begin brushing your child’s teeth as soon as they appear. The ADA and Academy of Pediatric Dentistry recommend that your child be examined within six months after the first tooth comes in and no later than the first birthday. A dental visit at an early age is a “well-baby checkup” for the teeth. Besides checking for tooth decay and other problems, the dentist can show you how to clean the child’s teeth properly, provide anticipatory guidance, and evaluate any adverse habits such as thumb-sucking. When teeth first come in, some babies may have sore or tender gums. Gently rubbing your child’s gums with a clean finger, a small, cool spoon or a wet gauze pad can be soothing. You can also give the baby a clean teething ring to chew on. If your child is still cranky and in pain, consult your dentist or physician. Most children have a full set of 20 primary teeth by the time they are 3. You may have sensitive teeth if ice cream or a sip of hot coffee sometimes creates a painful experience, or if brushing and flossing make you wince. In healthy teeth, a layer of enamel protects the crowns of your teeth—the part above the gum line. Under the gum line a layer called cementum protects the tooth root. Underneath both the enamel and the cementum is dentin. Dentin is less dense than enamel and cementum and contains microscopic tubules (small hollow tubes or canals). When dentin loses its protective covering of enamel or cementum these tubules allow heat and cold or acidic or sticky foods to stimulate the nerves and cells inside the tooth. Dentin may also be exposed when gums recede. The result can be hypersensitivity. Desensitizing toothpaste. This contains compounds that help seal the tubules and block transmission of sensation from the tooth surface to the nerve, and usually requires several applications before the sensitivity is reduced. Topical fluoride treatment. An in-office or at-home technique which strengthens tooth enamel and reduces the transmission of sensations. Root canal. In rare instances, if sensitivity is severe and persistent and cannot be treated by other means, this treatment may be recommended to eliminate the problem. Proper oral hygiene is the key to preventing sensitive-tooth pain. Ask us if you have any questions about your daily oral hygiene routine or concerns about tooth sensitivity. Taking an antibiotic prior to certain dental procedures is called “antibiotic prophylaxis.” At times, physicians (usually a cardiologist or orthopedist) and dentists recommend that a patient take antibiotics out of concern that bacteria from your mouth may enter the bloodstream and cause an infection elsewhere (bacteremia). Previous to the new guidelines, antibiotics were prescribed more frequently prior to dental procedures, however the accumulated bodies of research have largely shown the antibiotic prophylaxis to be mostly ineffective and unnecessary. The guidelines changed because more research has been accumulated, and the best scientific reviews found no evidence that antibiotic prophylaxis prior to dental procedures prevents infections of the heart or artificial joints. We all have bacteria in our mouths, and a number of dental treatments—and even daily routines like chewing, brushing or flossing—can allow bacteria to enter the bloodstream. For most of us, this is not an issue, because a healthy immune system prevents these bacteria from causing any harm. There is concern, however, that for some people bacteremia could potentially cause an infection elsewhere in the body. A history of an infection of the lining of the heart or heart valves known as infective endocarditis. Antibiotic prophylaxis guidelines also have been developed for people who have orthopedic implants such as artificial joints. In 2012, the ADA and American Association of Orthopedic Surgeons updated the recommendations and no longer recommend antibiotics for everyone with artificial joints. Personal medical history may be relied upon instead. For example, antibiotic prophylaxis might be useful for patients who also have compromised immune systems (due to, for instance, diabetes, rheumatoid arthritis, cancer, chemotherapy, and chronic steroid use). If you have a heart condition or an artificial joint, talk with us or your physician about whether antibiotic prophylaxis before dental treatment is right for you. Changing guidelines makes it confusing for people, however it is important to recognize the known risks of taking antibiotics may outweigh the uncertain benefits of preventing infection in the heart or artficial joint. Although antibiotics are often taken without significant issue, there do exist personal risks related to antibiotic usage, which include upset stomach and allergic reactions, which may be severe, and C. difficile infection, which causes diarrhea and other significant intestinal problems. Talk to us or your physician about these guidelines if you have any questions about antibiotic prophylaxis. Most of the time, a root canal is a procedure that can save the tooth and brings great relief with little to no discomfort. Each tooth has one or more tiny passageway in the center of the root called the root canal. In a healthy tooth, the space within the canal is occupied by nerves, blood vessels, and soft connective tissue called the pulp. Root canals are beneath the top of the tooth, coursing their way until they reach the tip of the root. Some tooth problems involve infections that spread to the pulp, which is the inner chamber of the tooth. When the infection becomes worse, it can begin affecting the roots. A crack or traumatic injury to a tooth can also compromise the pulp, leading to similar problems. A diseased inner tooth can have several problems associated with it, and pain and sensitivity may be the first indications of a problem. The infection can spread inside and outside the tooth, which can lead to an abscess. Root canal therapy is a remarkable treatment with a high rate of success, and involves removing the diseased tissue, disinfecting the inside of the tooth, and then sealing the root. Root canal therapy is designed to save a problem tooth that otherwise might require extraction. Following treatment, most patients have little or no discomfort or pain, and enjoy a restored tooth that can last a long time. A trip to Dr. Chalgren’s dental office is like a trip to the spa. Everyone is so gentle, kind, and thorough in their treatment of my children and me. There are plenty of toys to engage my children while they wait and the treatment rooms are bright and full of fun pictures for them to make them feel comfortable. The children and I look forward to our dental visits. Thank you, Dr. Chalgren!